Working the same kind of polite white funk as fellow contemporaries Miike Snow and The Whitest Boy Alive, but coming at it from a more guitar heavy, traditional rock n' roll angle, Portland-based Hockey put on one of my favorite shows at Coachella 2010. Lively, tight, and as immediately likable in sound and manner as an act can be, Hockey make having a good time easy. Unfortunately, that same immediacy that makes their brand of 80s party rock so winning on stage wreaks all sorts of havoc on this, their debut. Put plainly, Mind Chaos is a sinker...too spirited and funky and engaging to not please on first impression, but an album that offers nothing new after those first few listens, and comes to feel more and more pedestrian over time as a result. Luckily, though, not every song falls into this trap. Four Holy Photos has an enticing, laid-back, almost John Wesley Harding -ish drawl that always pulls me in, and Song Away and the fantastic Learn To Lose are just tremendously catchy crowd pleasers of which I never tire. But the rest of the tracks, after a listen or two...meh. 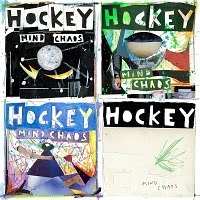 So I give Mind Chaos a mild recommend by the slimmest of margins based on the strength of the three tracks mentioned above, the album's overall rambunctious, positive tone, and the suspicion that if this very young band can just add some depth and nuance to their songwriting as they mature, we could be in for much bigger things. But for those readers with any hesitancy whatsoever, cherry picking the best tracks from this initial offering, especially Learn To Lose , is strongly encouraged. Cherry Picker's Best Bets: Learn To Lose , Song Away , Four Holy Photos , Put The Game Down . Here's the video for Learn To Lose . What were your thoughts on Mind Chaos? Let readers know in the comments section below.